It’s been really depressing around here the past few months for us Denver sports fans. The Broncos have just finished their worst season in more than 30 years, the Nuggets know their star player is getting traded and the Buffs failed to qualify for a bowl for the fourth time in the past five years. At least the Avalanche are winning, but no one notices because the NHL doesn’t get any coverage. That’s why I can’t wait for the calendar to turn to April, and we can get baseball season started. Strange as it sounds, the Rockies are the best product in the Denver sports scene, and it may not even be close now that they have locked up their two best players through 2017. In November the Rockies signed Troy Tulowitzki to a seven year $134 million deal. They followed that up this week by agreeing to a seven year $80 million deal with Carlos Gonzalez. What makes the Gonzalez deal so surprising is he is represented by Scott Boras, who is notorious for not allowing his players to accept hometown discounts. A Boras client almost always lets himself get to free agency, where he can cash in a megadeal on the open market. I say almost because Gonzalez is the only Boras client I can think of who has actually agreed to stay with his current team. In any case, Rockies fans should be dancing in the streets celebrating these signings. Sure the money is staggering, but the Rockies are finally doing what they refused to do for the first 15 years of their existence, lock up their star players. Look at teams like the Royals, Twins, Padres and other smaller market clubs that never spend the money to retain their best players. If the Rockies hadn’t made an effort to keep Tulo and CarGo, they would have surely been members of the Red Sox or Yankees in three years. I find it laughable that national reaction to these signing is not positive. After all the Rockies are doing what we continually criticize small market clubs for not doing: keeping their best players in the fold. An ESPN.com poll finds that more than half of fans think this is a bad investment on the part of the Rockies. I think the only reason that poll is slanted that way is because most national fans have no idea who Tulo and CarGo are. The Rockies are never on national tv (zero regular season appearances in the last two years), so it’s no wonder people think the Rockies are spending money wildly. The fact is that if either Tulowitzki or Gonzalez played for a big market team, especially in New York or Boston, they would be talked about as sure fire hall of famers. Because they play in Colorado, national folks don’t think these are great players. This assertion is absurd because I would stack Tulowitzki up against any shortstop in baseball. He is better defensively than Derek Jeter, has as much pop as Jimmy Rollins, and is in every way the definition of a team leader. As for Gonzalez, he is a true five tool player. He can play all three outfield positions flawlessly, can hit for power, and as he proved last season can be a legitimate triple crown candidate. He is so highly thought of that he was traded twice for All-Stars (Dan Haren and Matt Holliday). People nationally can think what they like, but I’ll take my chances with Gonzalez and Tulowitzki leading my offense for the next seven years. Let’s just say that I can’t wait for opening day this year. I see no reason why the Rockies can’t be a legitimate contender for years to come. After all, we do need something to look forward to here in Denver. Where was THAT all season?!? First I’m going to one more plea to Pat Bowlen: please dispense with the blue jerseys once and for all. The Broncos belong in orange. 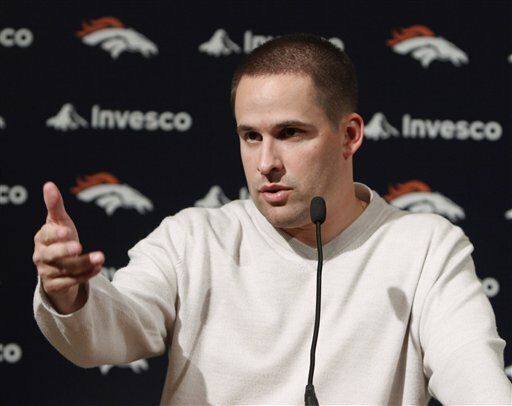 The biggest mistake the Broncos owner has made has nothing to do with coaching changes or player personnel. It was switching to those blue jerseys in the late 90s. Orange is the true Broncos color. The fans want it. It is time to make the switch back and correct the error. Secondly, I was going to spend a significant amount of time bashing Chiefs coach Todd Haley for his refusal to shake the hand of Josh McDaniels after the game. Since Haley has now apologized, I’m not going to waste a significant amount of time on that issue. I do think it goes without saying that Haley was 100 percent wrong, regardless of anything he thought the Broncos might have done late in the game. Besides after seeing the lead CU blew against Kansas, I’m willing to say that no lead is ever really truly safe anymore. 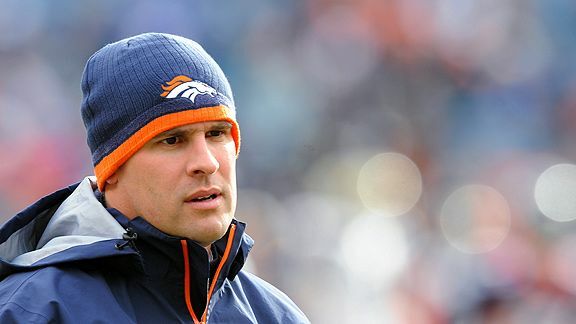 Now, as far as the state of the Broncos, it is amazing to think that they are just two games out of first place in the AFC West despite their 3-6 record. Well, maybe amazing isn’t the right word. What’s a one word description for “most mediocre division in NFL history”. Considering the Broncos have four games remaining against division opponents, the optimistic side of me is not ready to write them off just yet. What we saw Sunday from the Broncos was exactly what we needed to see: a running game that actually gained more than one yard per carry. The running game was so effective that Knowshon Moreno had a career high rushing day. It’s no coincidence that this is the first game that featured a healthy offensive line. The return of Ryan Harris at right tackle was especially critical. If the Broncos can continue to run with that kind of effectiveness, it is easy to get really excited about the prospects of the offense as a whole. The way Kyle Orton is throwing and the way Tim Tebow has proved effective around the goal line are all positives, but the running game remains the biggest key. Defensively, the numbers are a little misleading. Matt Cassel did have a career high passing day yes, but most of that came during garbage time when the Chiefs were throwing the football on every play. The important numbers for the Broncos lie in their rushing defense, where Denver held the Chiefs to just 51 yards rushing on 22 carries. Kansas City came into the game ranked number one in the NFL in rushing, while Denver’s defense ranked 31st. The Broncos stepped up and held Jamaal Charles and Thomas Jones to a combined 2.2 yards per carry. Mario Haggan also registered three sacks, including one that resulted in a fumble return touchdown by Jason Hunter to give the Broncos an insurmountable 35-0 lead in the second quarter. The bottom line for the Broncos is that the bye week really did them a lot of good. They were somehow able to shore up their two biggest areas of weakness, running the football and stopping the run. Granted, it’s only one game, and we may see the ugliness rear its head again next Monday night in San Diego, but at the very least it allows the Broncos to begin the second half of the season on the right foot. Is this a Super Bowl contender? Certainly not. Are they a playoff team? Highly doubtful. Only one 2-6 team has rebounded to make the playoffs in NFL history, and that was back in 1970. What I’m hoping is that the Broncos can continue to show improvement each week. 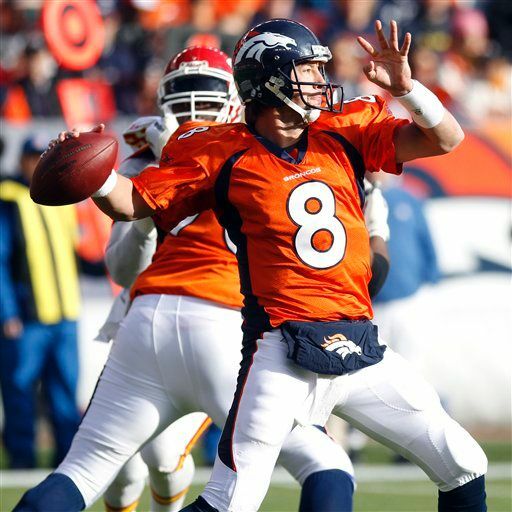 This win against a very good Kansas City team showed what the Broncos can be capable of. Now, let’s see if they are able to keep it up. I’m off to an 0-1 start this week. I’m picking the Thursday night games on my Twitter account. Last night the Falcons made a major statement by beating the Ravens 26-21 in the Georgia Dome. While I am tempted to rip into the Ravens for their inexplicable use of prevent defense, I instead will give a tip of the cap to Matt Ryan for leading the winning drive for Atlanta in the final minute. Atlanta proved that they belong in the Super Bowl discussion. I still think the Ravens do too. Now, on to the picks. By the way I am still alive in the eliminator pool thanks to picking the Saints last week (and managing to avoid picking the Patriots as they fell flat on their faces in Cleveland). – Bills over Lions: Because if the Bills don’t win this game they might very well be looking at 0-16. They have played hard in recent weeks, and this looks to be a game they might finally be able to win, mainly because Matthew Stafford is once again out for the Lions, already his third injury in his first two seasons. Detroit has shown they can now compete at home, but I’m still waiting for them to show something away from Ford Field. – Titans over Dolphins: How will Randy Moss fare in his Titans debut? Perhaps he’s the only one who truly knows, but the presence of a deep threat in the Titans’ offense can only help Chris Johnson. Tennessee’s defense has been one of the league’s best against the run this season, and that’s not good news for a Miami team that has seen both Ronnie Brown and Ricky Williams struggle at times this season. The Dolphins have still yet to win a home game this season despite outstanding play on the road. – Browns over Jets: I would say upset alert here, but to be honest I’m not so sure this can really be considered that big of an upset. I’ll say it again: I’m still not buying the Jets hype. They were extremely lucky to win last week in Detroit, and likely would have lost had Matthew Stafford not gotten hurt in the fourth quarter. I think Mark Sanchez is highly overrated and could do a much better job utilizing his weapons on offense. I also think the Browns may the league’s hottest team, having bumped off the Saints and Patriots the last two games. Last week I nearly called their win over New England but was too gun shy to pull the trigger. Not this time. Peyton Hillis is running well and Colt McCoy doesn’t look like a rookie. I like the Browns to win this at home. – Colts over Bengals: This won’t even be a game. Peyton Manning surely won’t allow the Colts to lose twice in a row, and especially won’t allow them to fall at home in a game where they are a clear favorite. Despite the injuries around him, he continues to be able to move the offense down the field. As for Cincy, Carson Palmer no longer looks like an elite quarterback, and the Bengals are so much of a soap opera that I don’t see them beating anyone right now, especially if Chad Ochocinco continues to not catch passes. – Jaguars over Texans: Please do a favor, next season if I pick the Texans to do anything, please send me a nasty note telling me what an idiot I am. I really thought that this would finally be the year Houston broke out and became a playoff team, especially when they won their first two games. The more I watch them however, the more I realize their defense still isn’t very good, and despite all the weapons offensively they continue to woefully underachieve. Meanwhile David Garrard has played out of his mind this year, and I sense a big breakout game for Maurice Jones-Drew this week. – Chiefs over Broncos: As much as I want to give my Broncos the benefit of the doubt coming off the bye, I just can’t do it. I really don’t like the look of this matchup, especially in the wake of leading tackler D.J. Williams getting a DUI last night. The Chiefs run the ball better than any other team, and pretty soon they will run even better once they realize that Jamaal Charles is twice as effective as Thomas Jones. The Broncos have been atrocious against the run in each of their past four losses, so from a matchup standpoint this just doesn’t bode well for Denver. Besides, I have picked the Broncos to win each of their past three games and they have lost them all. I hope that reversing my pick will also reverse Denver’s fortunes on the field. – Giants over Cowboys: This should be a popular eliminator pick for anyone, except I have already used the G-men this year. The Giants are playing as well as anyone in the NFC, thanks to a combination of effective running and passing to go with a defense that is more than doing the job. The time is long past to take the Giants very seriously as a Super Bowl contender? Dallas may well play harder for new coach Jason Garrett than they did for Wade Phillips, but it still doesn’t change the fact that Jon Kitna is under center. That alone makes it impossible to back the Cowboys in a road game right now against anyone. – Vikings over Bears: Minnesota is a bizarre situation considering that multiple players have anonymously stated that they want Brad Childress fired. Brett Favre is undoubtedly regretting his decision to come back this season, and the defense still isn’t playing anywhere close to last year’s level. Despite all that, they managed to get it together and pull off a come from behind win last week against Arizona. I think regardless of what the players think of Childress, they will still be professionals and show up on Sundays. For that reason, I pick them to win this game because I think they are much more talented than the Bears at virtually every position. If the Vikings defense can’t sack and intercept Jay Cutler, than things may indeed be hopeless the rest of the season. – Buccaneers over Panthers: This is my eliminator selection of the week. Tampa Bay is rapidly starting to show they may not be a fluke after all. They came very close to stunning the Falcons in Atlanta last week, and we just saw that same Falcons club prevail against Baltimore last night. They are quietly running the ball with reasonable effectiveness and are also displaying good defense and special teams play. My main reason this is the eliminator is because I think Carolina might well be the worst team in football, especially if DeAngelo Williams continues to be out of the lineup due to injury. Jimmy Clausen is back under center, and the poor rookie still doesn’t seem to get it. I really feel sorry for Steve Smith, who has to be frustrated that no one on the roster is remotely capable of getting him the ball. – Cardinals over Seahawks: This is an extremely boring matchup. Both teams will have poor quarterback play, a lackluster running game, and a subpar defense on display. I pick to Arizona to win on a gut selection, but I really don’t know as both teams are bad. Let’s just move on. – Rams over 49ers: I know the 49ers got the monkey of their back and a got a win before the bye, but something still doesn’t seem right with Mike Singletary’s crew. I’ll be curious to see if Troy Smith can keep up the surprising play he showed in London, and I’ll also be interested to see how the defense plays against a Rams offense that has been surprisingly effective as the season has progressed. Sam Bradford has to be considered one of the best rookie prospects in the last five years, and the running game continues to hum along with Steven Jackson. Call it a hunch, but I think St. Louis steals this one on the road. – Steelers over Patriots: The Sunday night offering should be a dandy, with two of the best teams squaring off. Both however are coming off losses in their most recent game, so one of them will have a losing streak by the end of the night. I think these two teams are so similar on paper in virtually every aspect that it’s tough to isolate a factor that will be the difference in the game. I think the Steelers run the ball slightly better than New England, and I also like the physicality of their defense. I think since the game is at Heinz Field, that gives Pittsburgh a slight advantage, but this game may not be decided by much more than a field goal. – Eagles over Redskins: Talk about two teams moving in opposite directions. The Eagles looked very impressive in their win over the Colts last week, and as long as Michael Vick continues to play like a legitimate MVP candidate they will be very tough to beat. The presence of DeSean Jackson also really helps their offense. The Redskins on the other hand are coming off a bad loss to the Lions, made even worse by Mike Shanahan’s boneheaded decision to insert Rex Grossman under center at the end of the game. How anyone could think Rex Grossman is a better option than the ball boy, let alone Donovan McNabb, is beyond me. Reports indicate that Shanahan may have caused a division in the locker room with that move. If true, Redskins fans should start to expect more losses in the near future.